An American hero, John McCain, who passed away on August 25, is being laid to rest today, next to his Naval Academy classmate and friend Adm. Charles R. Larson, at the U.S. Naval Academy in Annapolis. He never made it to the White House, but in his passing he has been accorded all the respect and honour that befits a President of the United States. McCain was just the 30th American to lie in State in the Rotunda. In the US, lying in state is a rare honour, wherein the mortal remains of a deceased person is placed in the rotunda of the US Capitol in Washington for public viewing; and the casket is guarded by the personnel of the US armed forces. He was a naval pilot. During the Vietnam war, he led 23 combat missions, until he was shot down in the last one, was captured and tortured as a prisoner. In 1981, he retired from the Navy, joined politics in Arizona. He served two terms in the House of Representatives, and five terms in Senate, elected last in 2016. Twice he threw his hat in the presidential poll ring. In 2000, he lost to George Bush in the primary, and in 2008 he lost to Barack Obama in the general election. On the day, America elected its first African-American President, November 4, 2008, I was in San Francisco on an official assignment, and around dinner time, I, besides many others in the restaurant, heard with rapt attention, John McCain's concession speech. There was no rancour, no ill will. Only humility, respect, and admiration, for Senator Obama who pulled off a remarkable victory, and for the American people, who scripted a revolution. McCain was a staunch conservative. But always willing to reach across the aisle. His inclusive approach to issues was so great that there was a section of Democrats who were willing to support McCain in 2008, which led to some turmoil. There was even talk of McCain having a Democrat as a running mate, but he abandoned the idea, considering the political complications that would ensue. Carl von Clausewitz, the Prussian philosopher of war, wrote in the early nineteenth century that "courage is of two kinds: first, physical courage, or courage in the presence of danger; and next, moral courage, or courage before responsibility." The late U.S. Senator John McCain demonstrated both types. 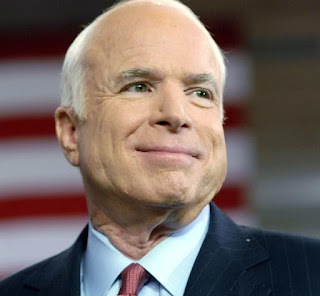 .... During my many meetings with him and his dear friends Senator Lindsey Graham and Senator Joseph Lieberman, McCain always tried to understand the wars in Afghanistan and Iraq from the perspective of the Afghan and Iraqi people. Empathy lay at the root of his humaneness, including his opposition to any form of torture. Especially in these times of radical polarisation, America will miss John McCain.